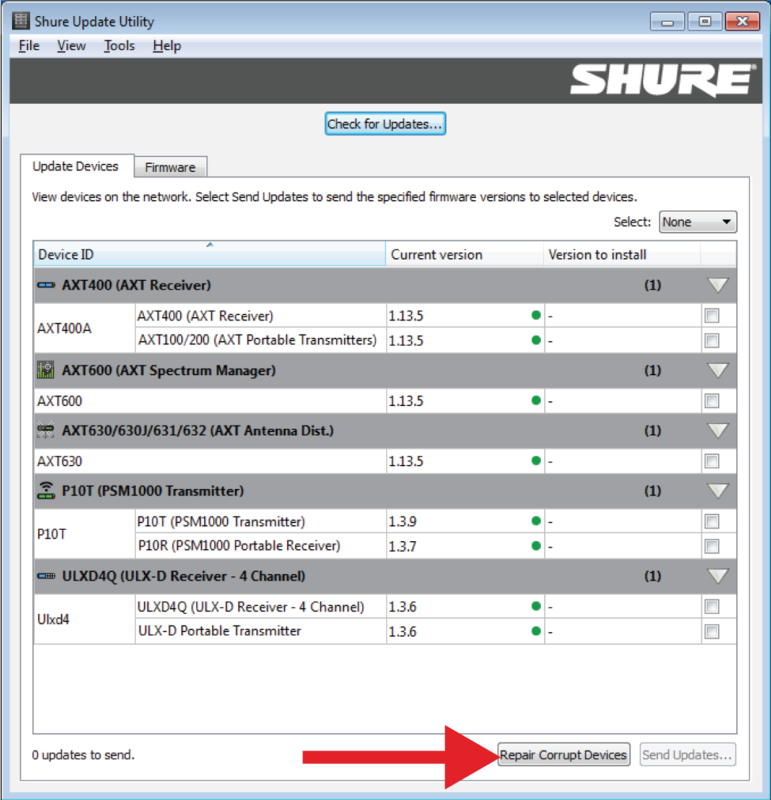 The Shure Update Utility (SUU) is an application used to update firmware for Shure devices. The application downloads new firmware versions and stores them locally on the computer. The updated versions are then available to send to multiple networked devices at the same time. 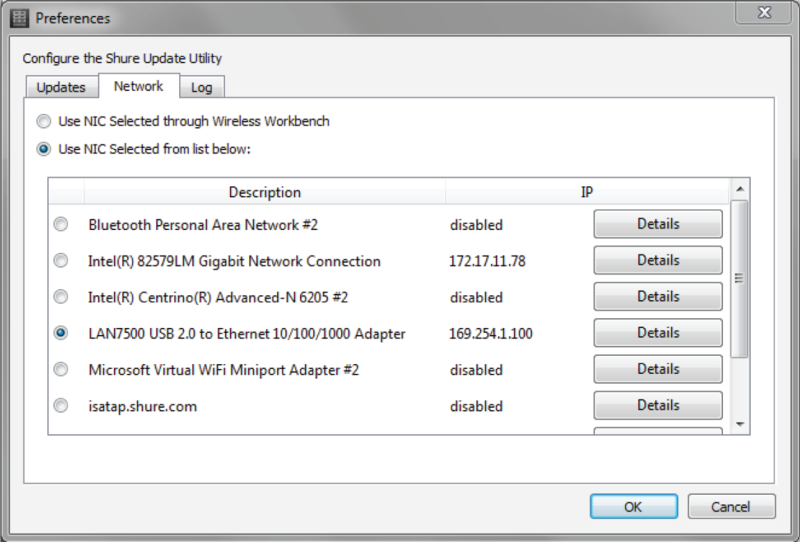 Additionally, the Update Utility enables software updates from Shure software applications such as Wireless Workbench®. Firmware is embedded software in each device that controls its functionality. Periodically, new versions of firmware are developed to incorporate additional features and enhancements. 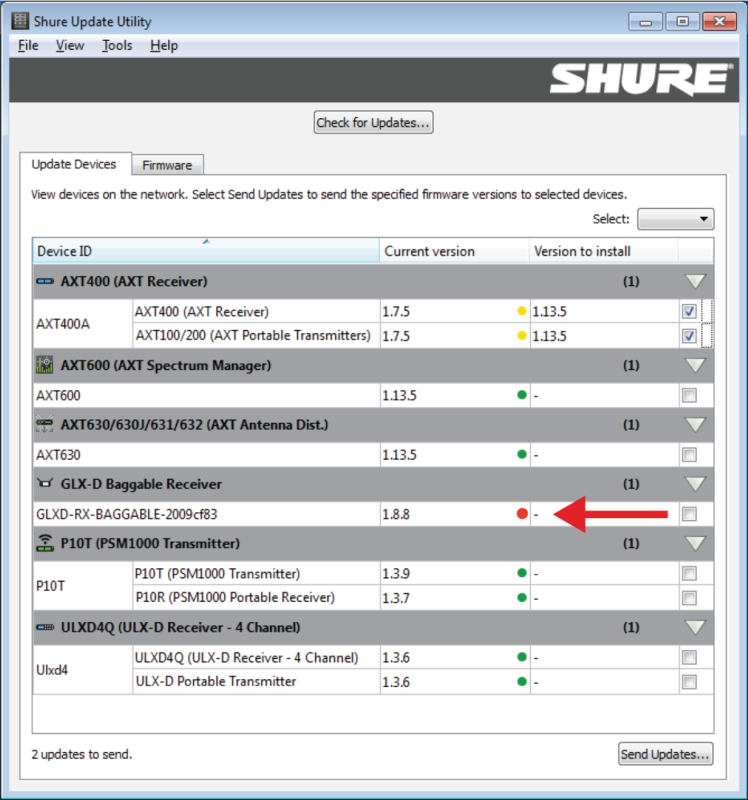 To take advantage of these improvements, new versions of the firmware can be downloaded and installed using the Shure Update Utility (SUU) application. The firmware of all Shure devices has the form of MAJOR.MINOR.PATCH (e.g., 1.2.14). To ensure interoperability, all components from the same model family (including transmitters) should be updated to the same MAJOR and MINOR firmware version numbers (e.g., 1.2.x). The following is a quick overview of the SUU application interface. See Interface Description for more details on each . Download new firmware versions to your computer. Displays all firmware versions downloaded to the computer. Updates the selected devices with new firmware. 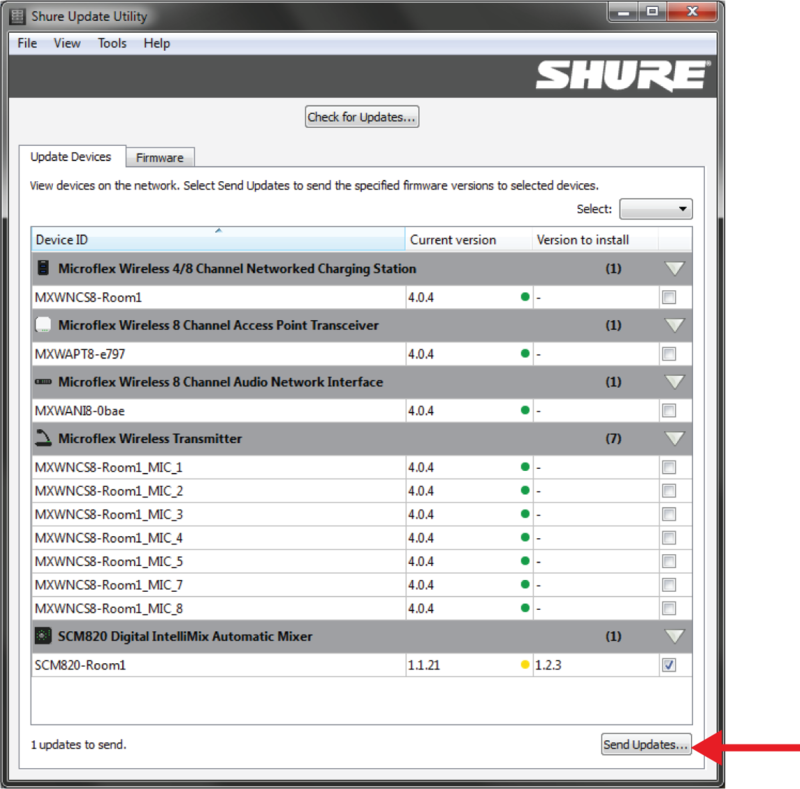 Download the Shure Update Utility from the Shure website: http://www.shure.com/update-utility. Occasionally, new versions of the application are released. Open the SUU on a computer that is connected to the Internet. 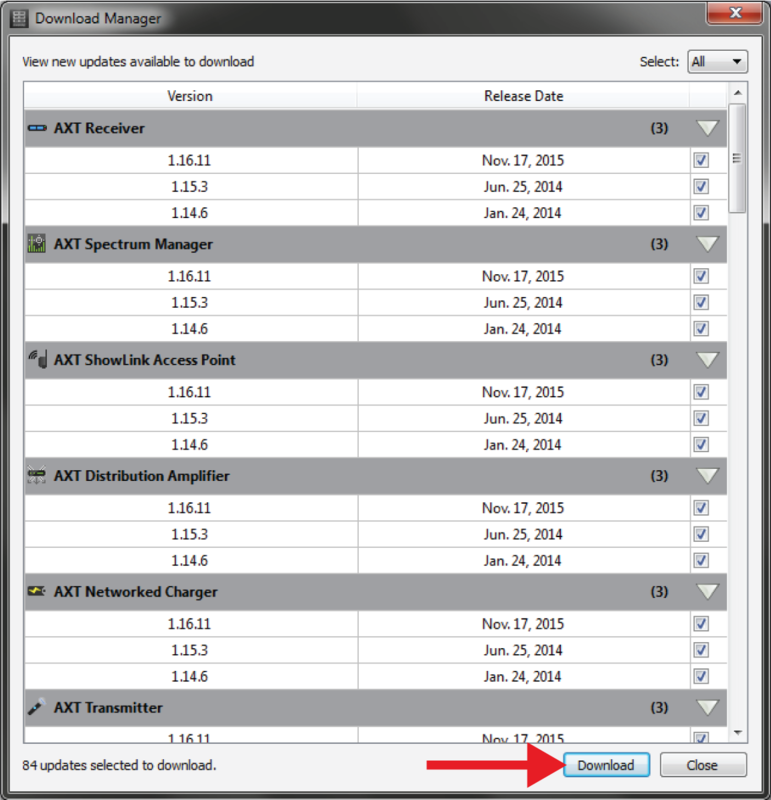 Select the Download button to download the latest version from the Shure webserver. Once the file has been downloaded to the computer, select Yes, Install Now to update the application. The application will reboot after the installation is successful. Note: Before updating the application, make sure all firmware updates have completed. The application will automatically reboot during the software update, and can interrupt the process of transferring firmware to devices. 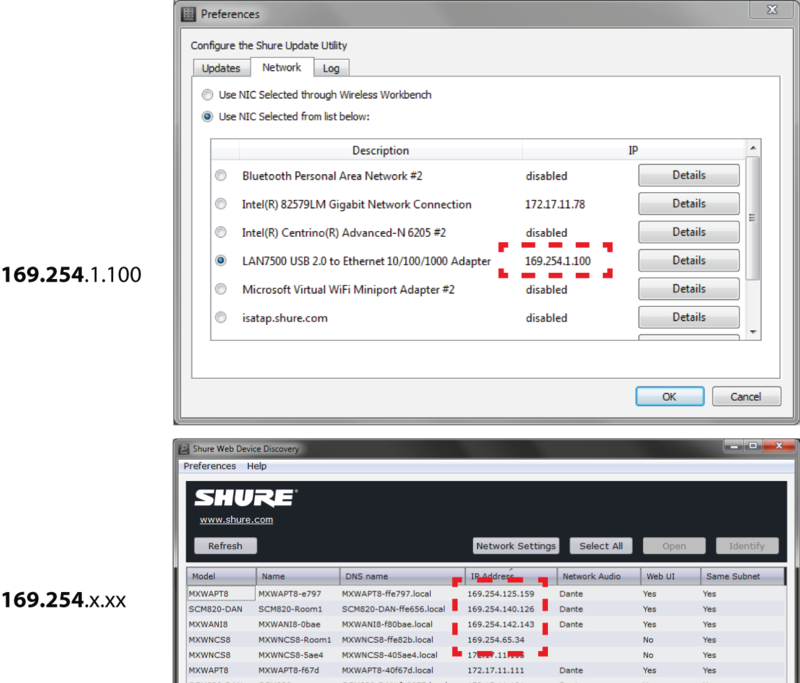 The SUU supports updates to other Shure software applications, such as Wireless Workbench®. 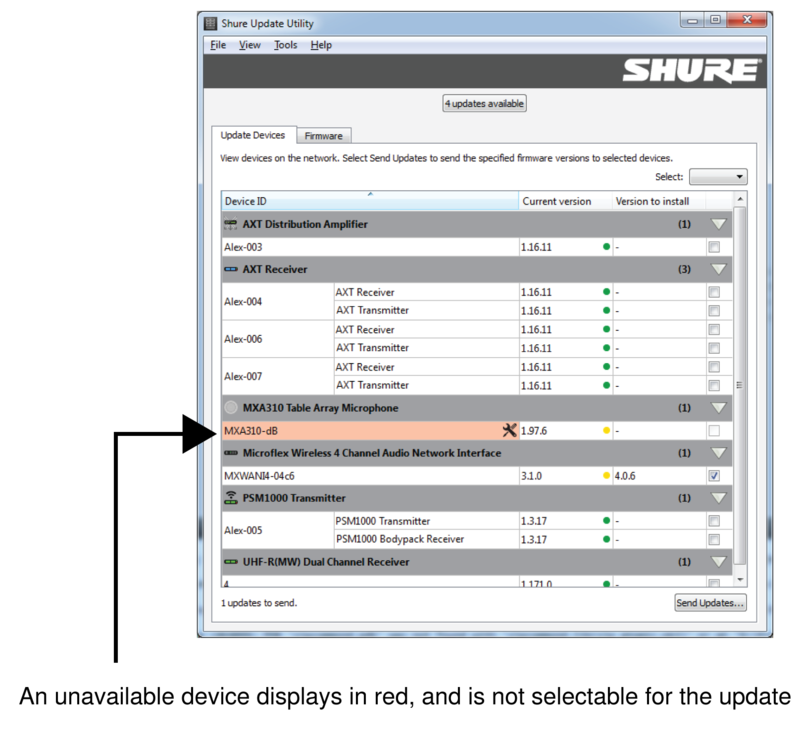 When you check for updates from a Shure application, the SUU facilitates the update process in the background as it connects to the Shure server to find new releases. Use the Shure Update Utility (SUU) application to download new versions of firmware from the Shure web server and upload them to devices. 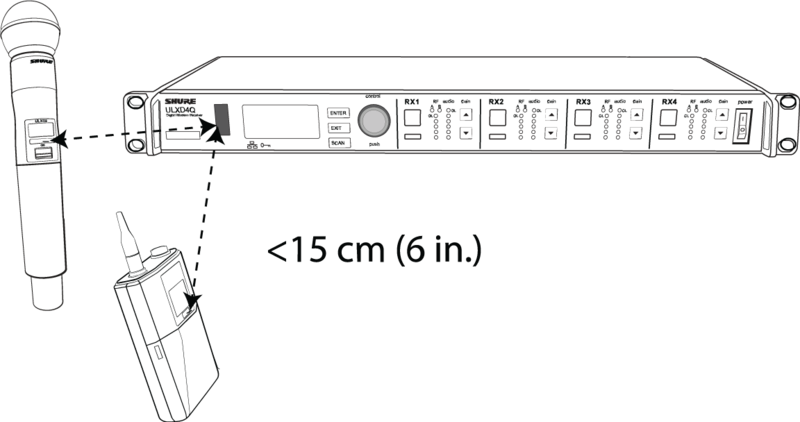 Note: See Updating Portable section for Shure devices that don't connect directly to a computer, such as a wireless handheld transmitter. 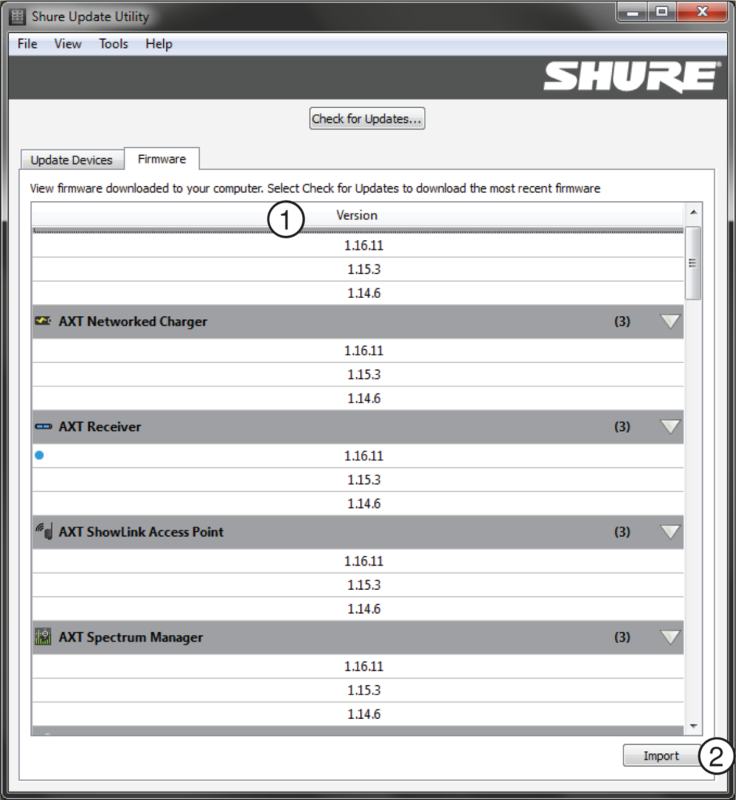 Download the latest firmware versions from Shure using the SUU. Click on the Check for Updates... button to view new firmware versions available to download. When the computer already has the latest versions, the No Updates Found message displays. Select the desired versions and click the Download button. The new downloads will be added to the Firmware tab, making them available to install on the device hardware. Tip: Select All to download all new firmware. 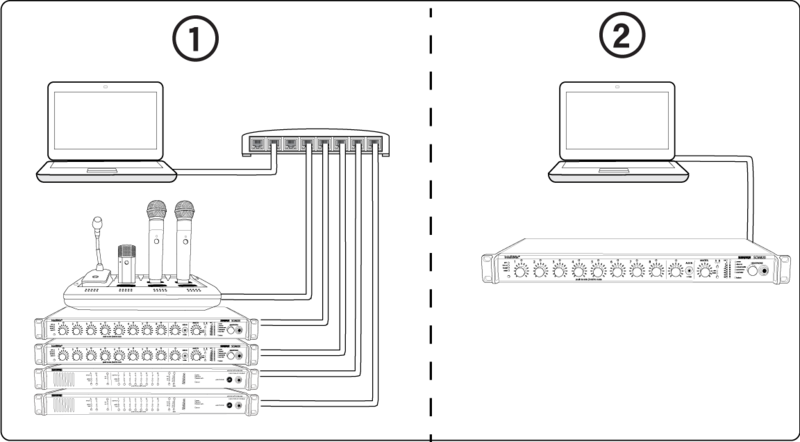 Choose the computer's network interface card (NIC) that the application uses to communicate with Shure devices. A wired network connection is required when updating a device's firmware. Select the network card that is on the same subnet as the devices connected to your computer. 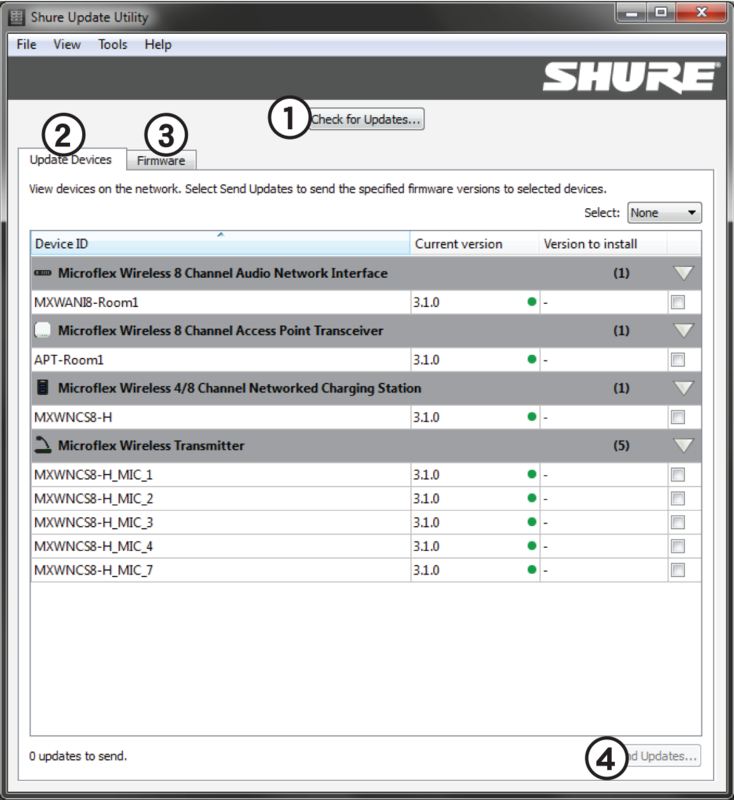 To verify they are the same, open the Shure Device Discovery application, which displays all Shure network devices connected to the computer. The IP addresses of the desired devices should match the NIC selection in the SUU. Push the updated firmware from the computer to the connected devices. Wait until the update processes is complete before turning off or disconnecting any devices. 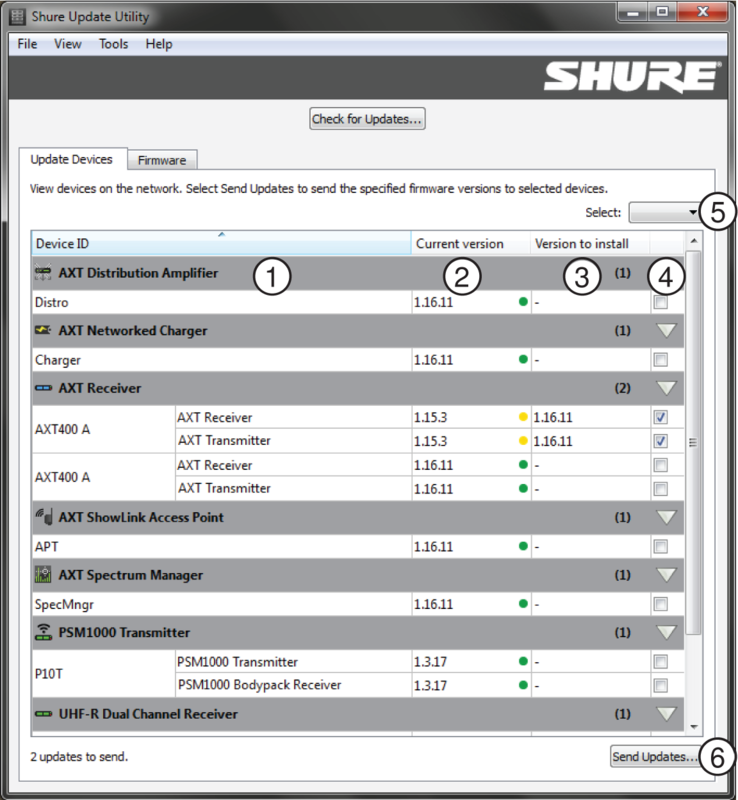 Open the Update Devices tab to view all Shure devices connected to the computer. Select each device that will receive a firmware update. Select a firmware version for each device under the Version to Install column. The newest version downloaded to the computer is selected for the update by default, though you can use an older version by double-clicking and selecting from the drop-down. Begin the update by selecting the Send Updates... button. The devices are not available for use during the update process. Close out of the window once the process is complete. Portable Shure devices, such as some handheld transmitters, update firmware over an IR sync with a networked device. The networked device hosts the firmware package for the portable device belonging to its model family. This package is uploaded using a special IR sync sequence. Exact steps may vary per device, see the device's user manual for exact details. For best results, ensure the same firmware version is uploaded to all components of the system. Connect the computer to the network device (use the same model family as the portable device). Open the SUU and find the device in the Update Devices tab. Select the firmware package for the portable device. Select Send Updates... to send the update package to the host device. Navigate to the portable firmware update screen on the host device. Align the IR port of host device with the IR port of the portable device. Start the firmware transfer and continue to hold the portable device in front of the IR port. The progress will display on the front panel of the host device. The portable device may reboot after receiving the new firmware. Displays new firmware versions available to download to the computer. Event Log: Displays time-stamped events regarding downloading firmware and updating devices. Release Notes: Links to the Shure web site to provide details on new features, improvements and additional notes for each firmware version. Check for Updates: Displays new firmware versions available to download to the computer. Preferences: Customize update settings and select the computer's network interface card (NIC) used to update the devices. Launches the Help document for the application. Download new versions of the SUU application. View the current application version. Displays all Shure devices by model that are networked to the computer. Device IDs are customizable from the device's control software. Tip: Hover over a device's Device ID to view its IP address, and right-click to copy it. Green: Device is up to date with the latest firmware version that is downloaded to the computer. Yellow: A newer firmware version has been downloaded to the computer and is available to upload to the device. Red: The device requires a firmware update for proper functionality. Drop-down window enables the selection of any firmware version that has been downloaded to the computer. A dash (-) appears until the device is selected to receive an update. Selects or deselects the device to receive a firmware update. Selects or deselects all devices in the Device List to receive a firmware update. Updates the selected devices to the specified firmware versions. Tip: A blue dot indicates that the version has been recently downloaded. Imports firmware versions from a local file or an external hard drive to the SUU firmware tab. Go to Tools > Preferences to adjust application settings. 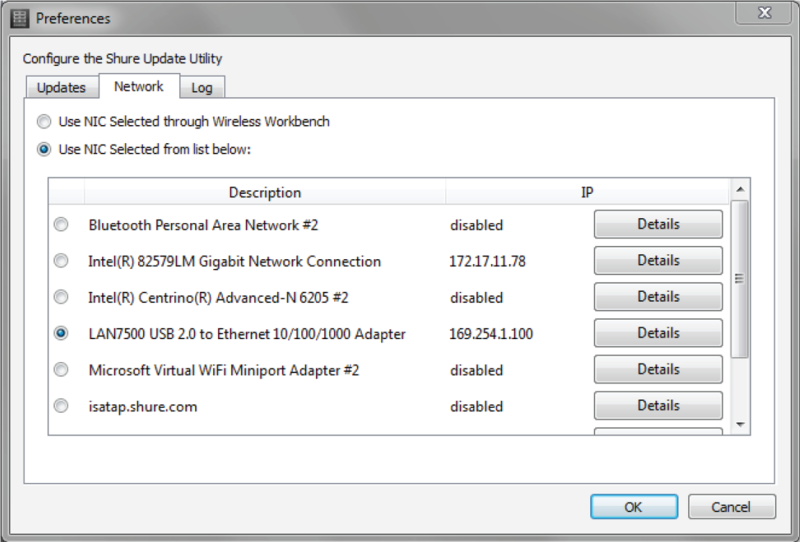 Use the Network tab to select the computer's network interface controller (NIC) to be used by the Update Utility. Firmware updates are only supported via a wired interface connection. Adjust the number of event log files stored by the computer. For additional Troubleshooting assistance or further information on complex installations, contact Shure to speak with a support representative. In the Americas region, call Systems Support group at 847-600-8541. For users in other locations, go to www.shure.com to find support contact for your region. If an error occurs during the update process, a recovery file is generated to prepare the device for a normal firmware update that will restore functionality. Use the Repair Corrupt Devices button that appears if an update fails. Upload recovery firmware by selecting Repair Corrupt Devices. Close the window when the recovery procedure completes. This button only appears if a connected device has a failed firmware version. The recovered device will display in the Update Devices tab with a red dot, indicating that a firmware update is required. Perform a normal firmware update to restore device functionality. 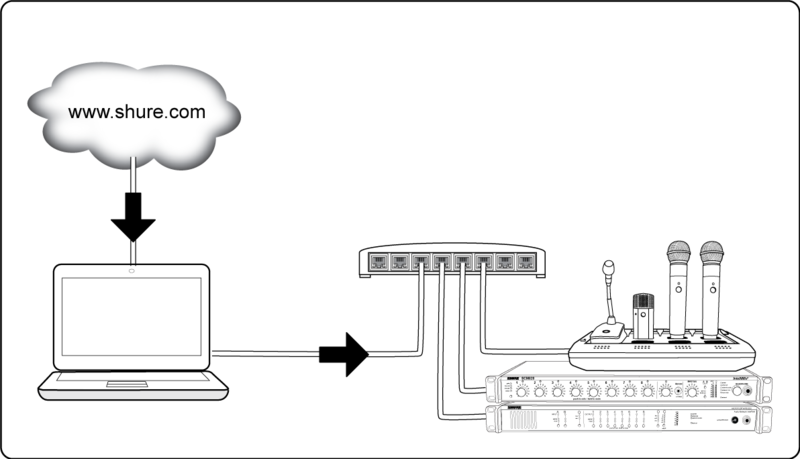 Device with multiple network interfaces has IP settings assigned to two different subnets (isolating control and audio data). Click on the settings icon to view the device details in the event log. Use the information to change a configuration or setting that is preventing the update.